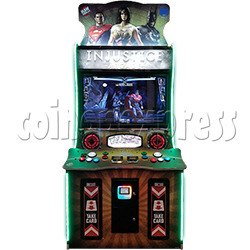 Injustice Arcade Card Game Machine (2 players ) is a "card vending" style arcade game for 2 players and comes with the one-on-one fighting game released by Raw Thrills. Injustice Arcade collect over 200 cards, scan up to 3 cards to build your team for typical fighting game, no joystick controls, only by buttons controls a team of three heroes to move and fighting, if you do not have a card, it will pick a random character selection. A single card is awarded after every match.